Alice and Tom Ford falling down the rabbit hole. Yves Saint Laurent Gauche dress. Helmut Lang watching an oversize Alice. Helmut Lang made-to-measure dress. 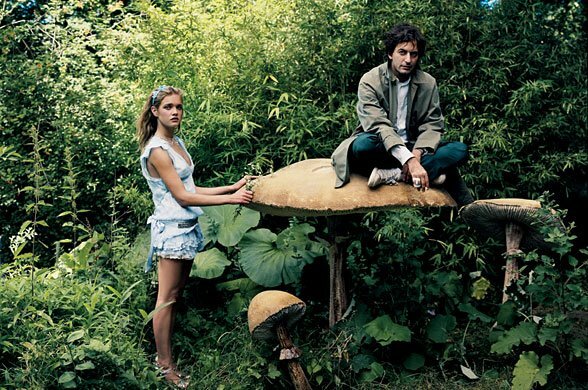 Alice trying to make sense of a mushroom dwelling Marc Jacobs. Marc Jacobs dress. Alice, a queer shaped creature and Karl Lagerfeld. Chanel Haute Couture skirt and jacket. Alice questions our grinning cheshire, Gaultier. Gaultier Paris dress. Alice encounters the nonsensical Victor & Rolf. Victor & Rolf dress. Alice is confronted by Queen of Hearts, John Galliano. Dior Haute Couture dress. Alice escapes through the looking glass as Nicholas Ghesquiere relaxes. Balenciaga dress. Yes, really great images, nice post!! I LOVE this one too. One day, when we have the opportunity (ho hum) we will do a shoot a little like this. I love this editorial, I’ve seen it before. but I didn’t get to see every scan of it, so this post was very helpful to me! It’s amusing how the designers pose in the photos.BTW, would you like to do a link exchange with me? just another iconic vogue italia spread !! and just another good editorial for the amazin vodianova !! amazing, why didn’t I see this?I love NataliaBTW I can’t find Helmut Lang in the photo; is he in the painting? This is ONE seriously awesome editorial. I love the concept. Very cool! oh yes I loved this editorial (and I still do 🙂 ) Definitely the best one of this kind! I loved this editorial when it came out. I adore the fantasy element of fashion. Beautiful. I LOVE the Helmut Lang dress. I think this is one of my favorite fashion editorials ever. Each time I see it, I wish I could fall down Annie Leibowitz's rabbit hole. I can't decide, however, which is my favorite shot, The one with KL or the one with John Galliano— I love them both so much! Those are some great spreads! Annie Lebovitz is a wonderful photographer. Thanks for sharing these! though i think the whole alice in wonderland theme has been played out, these are simply magical. These editorials are seriously incredible! I love them a lot a lot! I have seen a couple, but not all of these and thank you for showing them! This is my favourite shoot of all time. My friends make fun of me as I always use it for invites and things.